As Founder of Impulse NGO Network and Impulse Social Enterprises, I have won several awards and have been recognised for my contributions to people and society. While I have often been recognised for my individual efforts, the truth is none of what I did could have happened without the incredible support and tireless energy of my co-founders, team members, and countless partners over the years. Together we have conceptualised, planned, and implemented many programs over the past three decades, all of which bring us closer to realising our vision, of a world without human trafficking and exploitation; a world where women and children live with happiness and dignity in a safe and nurturing environment. Given below are some of the accolades we’ve received over the years. 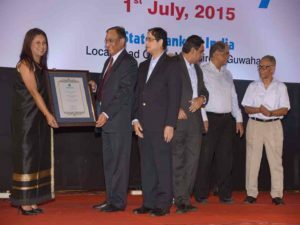 The State Bank of India North East Circle Award was conferred on Hasina Kharbhih, Founder of Impulse NGO Network, in recognition of her Selfless Service and Outstanding Contribution to Society. I received the prestigious “North East Excellence Award” from the Indian Chamber of Commerce, for my contribution as a social entrepreneur to the development of the Northeast region, through Impulse Social Enterprises (ISE), which is a hybrid business model related to livelihood creation, under “Prevention” pillar of the Impulse Model. 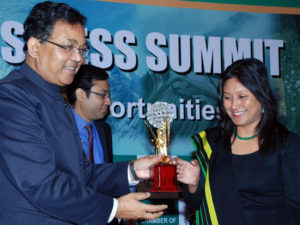 This award was conferred upon me, for taking the issue of child-labour in the rat-hole mines of Meghalaya, to global audiences, to create awareness in the supply-chain and investor community, that resulted in the withdrawal of orders and investments in the sector, hence reducing the recruitment of child labour for these mines. The Ryan Foundation aims to conduct socio-cultural activities and impart sound education while working for a wide range of public interest issues and national causes. The award recognized her work with HIV/AIDS education, empowering women and children and creating income-generating programmes for rural youth and women. 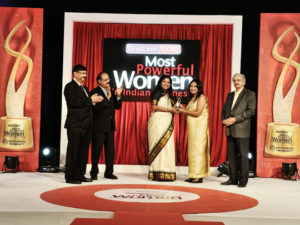 Hasina was recognized for her work and excellent services in the fields of Freelance Journalism and Social Service. Hasina received a special prize in essay writing for her submission to the “Born to Win” National Level Competition. Hasina won Honourable Mention for her poem “Feelings” in The All India Poetry Contest held by The Quest, a biannual publication of Indian writing in English. World Social Work Day is observed every year on the 17th of March, when social workers around the globe highlight their work and receive recognition for their invaluable contribution to society – in countries, all over the planet. 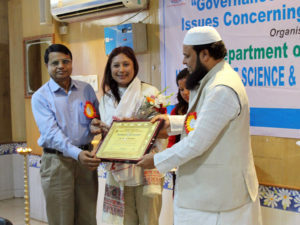 The University of Science and Technology (USTM) Meghalaya, gave an Award to Hasina Kharbhih, Founder & Chair of Board, Impulse NGO Network for her outstanding and visionary contribution to the field of social service and her endeavour to ensure equality and social justice. 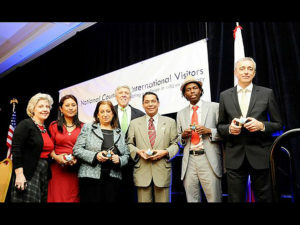 Hasina Kharbhih received the Gold Star IVLP 2013 (International Visitor Leadership Programme) from National Council of International Visitor (NCIV) supported by United States Department of States Bureau of Educational and Cultural Affairs. She was among the six Gold Star IVLP, who were awarded this year others recipients from Zimbabwe, Iraq, Brazil, Burma, and Slovenia. 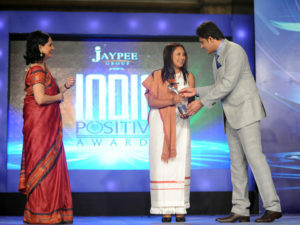 The CNN-IBN India Positive Awards salute those Indians who spread the spirit of goodness, and bring about positive change around them, through selfless acts of their own. I was one of the select few Indians honoured at the inaugural edition of the award, for my work against child labour in the rat-hole mines of Meghalaya. Northeast Television (NETV), a private satellite multilingual channel of North East India, held its first NETV People’s Choice Awards in 2005. The multidisciplinary awards were brought forth to honour the “revolutionaries and unsung heroes of the Northeast.” Hasina was awarded a trophy and named Social Activist of the Year. 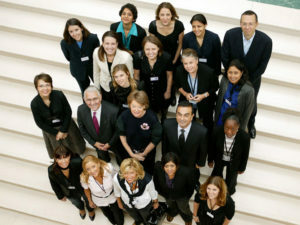 The Women’s Forum Rising Talents program developed in partnership with JPMorgan and Egon Zehnder International, aims to create an international network of talented young women with demonstrated leadership, achievement, and social commitment. Hasina was selected as one of 20 Rising Talents in 2007. Commonwealth Youth Programme (CYP) of the London-based Commonwealth Secretariat is an international development agency that works to provide young adults (aged 15-29) with skills, confidence, and avenues to initiate better futures for themselves, their families, and their communities. 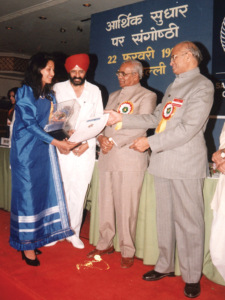 The CYP Asia Award for Excellence in Youth Work was launched in 1995 and recognizes individual initiatives for innovative work within the Asian Commonwealth countries. In 1999-2000, Hasina received the award for having introduced community education that promotes the well-being of youth in Shillong. 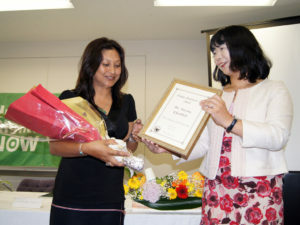 In addition, the award recognized her youth-related work as Team Leader and founding member of Impulse NGO Network. By publishing youth counselling columns/queries and organising seminars on topics including youth leadership, adolescent health, and entrepreneurship development for unemployed youth, Hasina established youth programmes and community education in Shillong. The Indian Council for Small and Medium Exporters (ICSME) recognizes people and companies that promote the economic development through export promotion. In 1996, Hasina received the Niryat Rattan Award for marketing handicrafts from Meghalaya to the international markets. 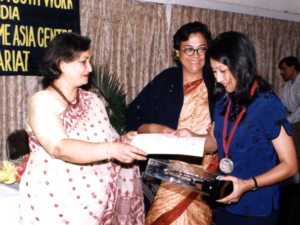 At the same time, her sister concern M/S Sen Kharbhih exporting company also received recognition from this agency.